Oriental Longhair cat breed and advice. Oriental longhair cats have silky, flowing coats with a long plume of a tail. Oriental Longhairs are the semi-longhair version of the Oriental cat breed. 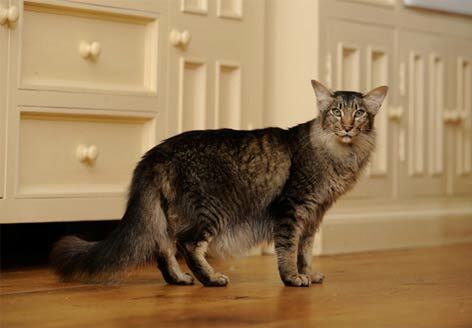 Oriental Longhairs have silky, flowing coats with a long, elegant plume of a tail. There are an incredible 300 colour and pattern combinations to choose from. Carol explains: "The coats of the Oriental now come in solid colours ranging from black, blue, lilac, caramel, cinnamon and fawn. The red series has bright red coats, with diluted versions in paler cream and apricot, and of course the tortoiseshells." These colours also come in tabby and silver versions, while the chocolate and white Orientals now have their own names - the former is known as the Havana and the latter a Foreign White. Orientals have graceful, athletic bodies with long legs, a flowing tapering tails and neat little spoon feet. They have the same triangular shaped head as the Siamese with large ears set at the 'ten-to-two' position with bright green slanted oval eyes. "Kittens are not sold by reputable breeders under the age of 13 weeks," Carol advises. "They must be fully vaccinated and the buyer should be shown a full vaccination certificate, showing the first and second doses of vaccines for cat 'flu and enteritis as a minimum. It's best to ask your own vet what should be included on the vaccination certificate before you purchase." Responsible breeders will also ask you lots of questions about your home and lifestyle to make sure you are a suitable candidate for their kittens. Expect to pay upwards of £400 to £500 for a pet quality Oriental kitten, and make sure you buy from a reputable, Governing Council of the Cat Fancy (GCCF) registered breeder. It is thought that many of the descendants of the modern-day Siamese cat breed had a 'self' pattern with green eyes, but when several solid 'Siamese' were imported to the UK in the 1800s, it was decreed by Siamese breeders that true Siamese were 'pointed' with blue eyes, so they decided these cats were a different breed altogether. The earliest known record of a self-coloured brown shorthaired cat was in 1894, but the first volume of the Siamese Cat Register published in 1924 listed three black cats of Siamese-type born in the 19th century.